Step inside the world’s greatest outdoor street art museum and experience, Tony Goldman’s vision of the Wynwood Walls, like never before. Learn about the ever-changing murals by some of history’s most legendary graffiti writers and iconic street artists. Passionately led by “Miami’s Best Graffiti Guide” and local artists Ryan the Wheelbarrow & Pedro AMOS. 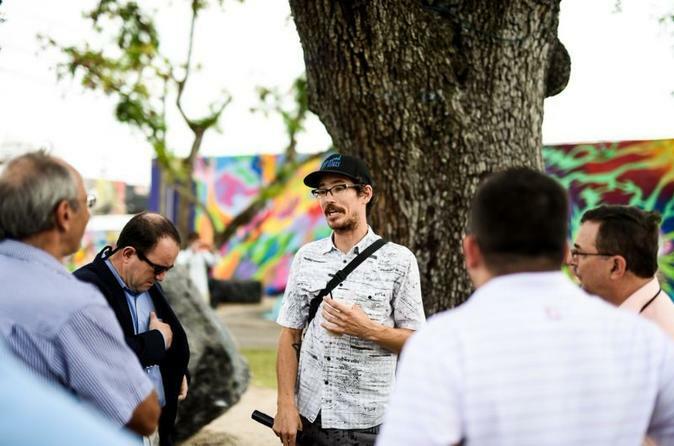 After checking-in and meeting your official tour guide at The Wynwood Walls Shop, the one hour tour will start in the front courtyard of the walls. There you will see and learn about some of the most prominent street and public art in the world, including Shepard Fairey’s iconic stenciled designs featuring a portrait of Wynwood Walls founder, Tony Goldman. You will learn about the history of Tony’s company, Goldman Properties, and how it transformed Wynwood, a warehouse district, into the hottest, most instagrammed spot in Miami. Learning about different murals as you walk, the tour will then pop into the Peter Tunney gallery with his current “Excerpts from the Taj Mahal.” While learning about Tunney and his work, you may even have the chance to meet the man himself, as he can often be found smoking a cigar or talking to other artists in his gallery. From here, you will pass under the shady trees into The Wynwood Doors, featuring framed walls of world renwoned artists such as Tavar Zawacki, VHILS, Audrey Kawasaki, Ernest Zacharevic, and Miami’s own Tatiana Suarez. You’ll also find permanent sculptures including Alexis Diaz’s “seahorse” and Ken Hiratsuka’s three boulders, each carved with a single, non-intersecting line. You will then pass into the Wynwood Garden where you’ll see the endangered Florida panther sculpture made out of recycled trash (including an old airplane) by Portuguese powerhouse Bordalo II. Finally, make your way through the Goldman Global Arts Gallery, showcasing artwork from current and past Wynwood Walls Artists. We take pride in the fact that all of our tours are 100% artist led. Learn about the creative process, gain insights on this history, ask questions about the artists--there’s a good chance that the tour guides know them personally! When you leave the Wynwood Wall, you will have a better understanding of the street art world and gain a lasting appreciation for public art.